The history of the Cosmos Club is present in every room, not as homage to the past, but as a celebration of its continuum: a reminder of its origins, its genius, and its distinction. 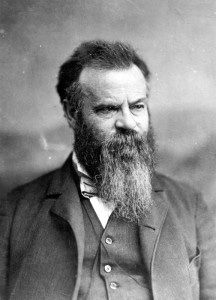 Clarence Dutton, soldier and geologist, was asked by his New York City friends, “Why have you not in Washington a club like the Century?” His circle of friends met to organize one at the home of John Wesley Powell, soldier and explorer, ethnologist, Director of the Geological Survey, and consummate organizer. Powell and his colleagues were at the heart of these efforts. There were other societies, but they tended toward specialization and formal meetings. Powell’s vision was a center of good fellowship, a club that embraced the sciences and the arts, where members could meet socially and exchange ideas, where vitality would grow from the mixture of disciplines, and a library would provide a refuge for thought and learning. It was called the Cosmos Club.